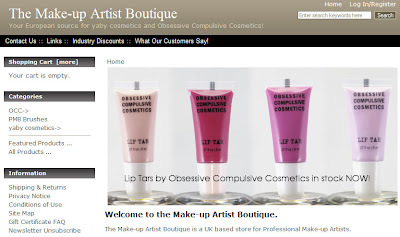 Just in – Sale at The Make-up Artist Boutique! When you get to the checkout and you’ll get an extra 5% off, making a total of 15% off any purchases you want to make! The sale starts Monday morning, and goes on until Friday. Don’t miss out. I’m going to finally complete my lip tar collection, I want vintage, plum and … erm, another one. What’re you going to get? The Small Print: I am not affiliated with The Makeup Artist Boutique and I will receive no remuneration if you click on any of the links contained in this post, or if you make any purchases as a result of this posting. They, are, however really lovely people, and hey! Who doesn’t love a discount?